Legal Label, Inc., in partnership with The International Sleep Products Association (ISPA), has released an updated and expanded electronic version of the Manual of Labeling Laws. The publication is an indispensable tool that helps mattress manufacturers navigate the complexities of labeling their products for sale in different states. 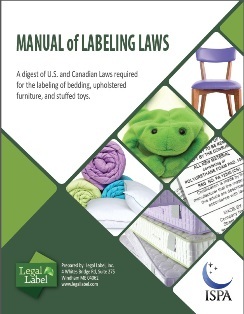 This resource contains comprehensive information on U.S and Canadian laws regulating the labeling of new and secondhand bedding, upholstered furniture, and other products. The purpose of these labels is to protect consumers from unknowingly purchasing a secondhand product or product that contains unsafe or unsanitary materials. It is critical to know the details of product labeling, because exactly which products require law labels and the labeling and registration requirements themselves can vary from state to state. Mistakes can result in costly sales and business interruptions. This “must‐have” manual is provided as a free benefit to all ISPA members. Others may purchase the manual for $395.For more information, to purchase online or to download your free copy, please visit ISPAs website. Note: ISPA members will need their ISPA web site login and password to access the publication. Check out our YouTube Video about the history of the Manual!